Migraines are an unpleasant experience no matter the frequency. Migraines are not fun, but they are an all-too-common reality for many in the U.S. According to the Migraine Research Foundation, 38 million men, women and children across the country are affected by these severe, throbbing headaches. Of these people, more than 90 percent are unable to function normally while in the midst of a migraine. "Caffeine withdrawals can activate the migraine center of your brain." If you can't get through the day without multiple cups of coffee, you may be setting yourself up for a caffeine withdrawal down the road. Prevention magazine reported that these withdrawals can activate the migraine center in your brain and trigger the condition. So you can head off a migraine before it even begins by being consistent with your caffeine consumption and limiting yourself to 200 mg a day, which is about two 8-ounce cups. However, once a migraine begins, the solution may actually be more caffeine. According to the American Migraine Foundation, caffeine does seem to provide some pain relief, but should be used moderately. If you treat your headaches this way more than twice a week, you may develop a dependency that can actually exacerbate the condition. Everyone has those days when there's just not enough time to get everything done and eating slips to the back burner. But if you get migraines regularly, try to be intentional about eating consistently. Skipping meals can increase the risk of this condition, according to Mayo Clinic. Cooked yellow, green or orange vegetables. Dried or cooked non-citrus fruits. Cherries, prunes, cranberries and pears. Citrus fruits, apples and bananas. When you feel a migraine coming on, try to head it off by creating a calm environment. Go into your bedroom, shut the door, pull the blinds and turn off the lights. Because migraines can make you more sensitive to light and sound, eliminating these environmental factors can make the experience more bearable. Applying a cold compress on your head or neck may also help provide relief. Or you can try relaxing your muscles with a hot bath or shower for a similar effect. Retreating to a quiet, dark room may help relieve some of the pain you experience during a migraine. Alcoholic and or caffeinated beverages. Environmental changes, such as barometric pressure. Once you identify your triggers, learning how to avoid – or at least manage – them can help reduce your symptoms or potentially avoid migraines altogether. "Whether you're in the midst of a migraine or trying to prevent one, stress management is critical." Whether you're in the midst of a migraine or trying to prevent one from occurring in the first place, stress management is critical. As previously mentioned, a hot bath or shower is a good way to both relax your muscles and relieve any emotional stress you may be feeling. Of course, when you're in pain, stress management may be easier said than done – especially if your migraine is preventing you from working or taking care of other commitments. If you suffer migraines regularly, think ahead so that you have a plan in place before a migraine strikes. That might mean arranging for an emergency babysitter who can take the kids with little notice, or talking with your manager about how you'll make up any work that you miss. Taking care of these details in advance will take a lot of the stress out of the situation. 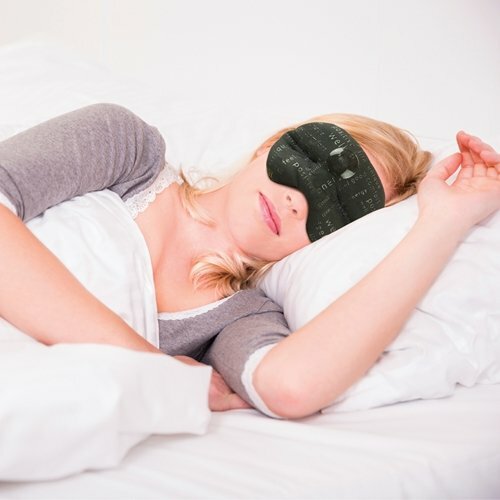 When a migraine hits, find relief with the Intellinetix® Vibrating Pain Relief Mask. This rechargeable mask features small, vibrating motors that help block the pain signals sent to your brain during a headache. Made of soft, breathable cotton with massaging ergoBeads, this product has been designed with your ultimate comfort in mind. Order one online at Amazon.com today.